Warning : Proud Mother Alert Ahead. Child#2 has been doing an enrichment program at school, as for an assignment needed to choose a person who was “Eminent”. I’ll wait while you go look up that word. That’s a big word for primary school. c: that you think you know and don’t really care. 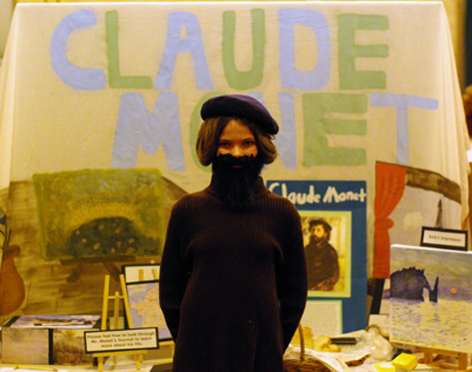 Anyway, I’m not going to tell you, but Child #2 chose Claude Monet, the french painter. They have been working all term, and she has been studying what she can at home, learning and getting to know Mr Monet. I have been alongside and inadvertantly picked some stuff up too. She has really come to know about him, and is looking all sorts of things up that are related. It’s been fun, and we have got into all manner of conversations over it, from art to turburculosis. She really has taken a great interest in the history of Monet, and all that surrounded his life. She has done a “learning centre’ as part of her assignment, and I just gotta say… it’s wicked! This learning centre had to have things in it using her creativity, so others can learn about her person. She took one of my white sheets (Halloween sheet, so it’s ok) and painted her background, Monet’s table and a window, and filled her table with things to give you a better understanding of the ‘person’. (There’s cool stuff in this personality box that I will photograph when it comes home). Her questions and answers box is a paintbox, I thought that was kind of cool, instead of just a box and in it she has put open ended questions, which she needed to know all the answers to. She needed to dress up and have food like he would have, so she chose the fine cheese, camembert and french sticks. Her display also has that painting she has completed – Monet style, impressionism – you’ve seen that already, but in this photo you can see better part of her background sheet, the Eiffel Tower in the window. She drew that whole background herself, freehand, and painted it herself too. I am very proud of her. Can you tell? Every kid there tonight presented beautifully, and it is wonderful to see the calibre of each child’s project. (Yes, I know I know, it’s all about MY child, but there was a fabulous group of them who all did a different “person”). They all knew so much about their “person” and conveyed this to their audience in interesting and creative ways. There sure was an assortment of people. Of course I can’t post pictures of the other kids without permission, but believe me when I say that they all made a terrific effort and should be highly commended. Ok… proud mother will shut up now. And you should be very proud of her Tania. I think that its great you share your children with us. Wow Wow Wow- I certainly never did any schol projects as creative and as excellent as this!! I’m with Louise – my projects never came near this!! Go Em! I saw her working and working and working towards it and she but in an enormous effort and had a fantastic outcome. She is a very very talented little girl. Go emma, you did wicked.